A new mattress can make all the difference with how well you sleep at night. Memory foam mattresses that are made with bamboo, in particular, are excellent because they help absorb odors while keeping the bed as fresh as possible. While there are many memory foam mattresses on the market, not all feature bamboo. To narrow down your choices, five of the top bamboo mattresses are listed below. This mattress features 10″ of support thanks to 5″ of support on the base followed by 2″ of support foam, 1″ of aloe vera transition foam, and 1.5″ of bamboo charcoal memory foam. The charcoal and bamboo are essential in this design, as they help eliminate odors in the bed while pulling moisture away from your body as you sleep. This hypoallergenic bed also features aloe vera infusions that help keep the bed fresh while encouraging a deeper sleep every night. Another unique feature of this mattress is are the coils, which help provide better balance and support. This plush 14″ mattress is made with three layers to ensure ultimate comfort and eliminate pressure points that cause back and joint pain. These layers include 1″ of bamboo charcoal, 3″ of ventilated gel memory foam and 10″ of high-density base foam, all of which come together to create a supportive and soft sleeping surface. The bamboo and charcoal, in particular, are excellent additions that help get rid of odors while keeping you cool as you sleep. This bed also features CertiPUR-US certification and it does not contain any dangerous or chemical-laden synthetic latex of any kind. To further enhance your rest, this product features a breathable and moisture regulating cover that’s made with Tencel blend fabric. As one of the tallest memory foam mattresses available, this is an excellent choice for those who want a bed that makes a statement. It’s made of several layers, beginning with 10″ of supportive high-density base foam. From there you’ll find 2″ of natural latex foam, 3″ of ventilated gel foam and 1″ of bamboo charcoal memory foam sitting on the surface. Over that is a removable cover that’s breathable for reduced heat while you sleep and easy washing in your home washer and dryer. This product also features open-cell technology that helps better adhere to every curve of your body to reduce pain and support aching joints. The bamboo and charcoal are added benefits, as they absorb moisture and odors for more restful sleep. Available in twin, twin XL, full, full XL, queen, king, and California king, this 12″ memory foam mattress is an excellent addition to any home. 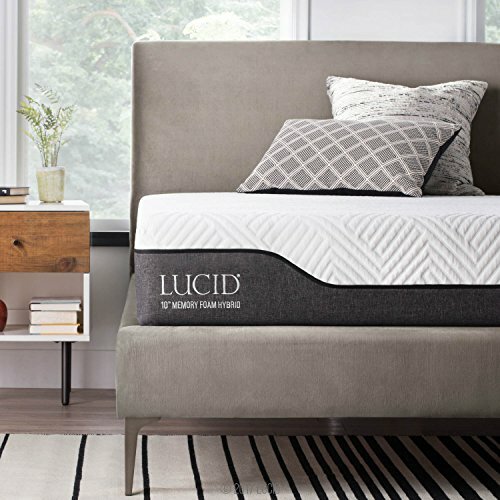 It is designed with 8″ of high-density base foam for support, 1″ of charcoal and bamboo memory foam for freshness, and 3″ of ventilated gel memory foam for comfort as you sleep. The mattress is then enclosed in a Tencel-blend cover that’s breathable and easy to clean. When you lay on this, the bed forms to your body and supports the natural curves of your lower back, shoulders, head, neck, and other areas that commonly ache after a long day. This can help you wake more refreshed while simultaneously helping to alleviate chronic aches and pains. For those who tend to get hot at night, this product can help with the gel beads that are in the top memory foam layer. With several sizes available, including twin, full, king and queen, this mattress can fit frames for any bed you have in the home. It features several layers of support for comfortable sleep, which begin with 7″ of support foam, 2″ of soft foam, 1″ of gel memory foam and a top layer of bamboo fabric. As an antibacterial and UV resistant bed, this is an investment that you can expect to last for years to come. It provides exceptional comfort and is CertiPUR-US certified for safety, indoor emissions, and durability. If you’re looking for something that offers full-body support for better alignment, this is the ideal choice. Sleep is one of the most important parts of your night, as it helps you prepare the day ahead. If you don’t have a mattress that facilitates quality sleep, then it’s worth looking into those listed above for a change. They are well worth the investment and have positive reviews to prove it. With most offering warranties, you will want to take the chance to see what a difference a good mattress can make in the way you sleep. If you’re like most, it will help you wake more rested and energetic so you can tackle the day ahead without fatigue or pain.